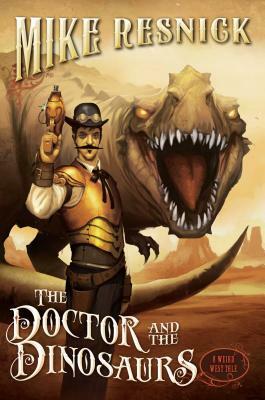 Welcome to a Steampunk wild west starring Doc Holliday, with zombies, dinosaurs, robots, and cowboys. The time is April, 1885. Doc Holliday lies in bed in a sanitarium in Leadville, Colorado, expecting never to leave his room again. But the medicine man and great chief Geronimo needs him for one last adventure. Renegade Comanche medicine men object to the newly-signed treaty with Theodore Roosevelt. They are venting their displeasure on two white men who are desecrating tribal territory in Wyoming. Geronimo must protect the men or renege on his agreement with Roosevelt. He offers Doc one year of restored health in exchange for taking on this mission. Welcome to the birth of American paleontology, spearheaded by two brilliant men, Edward Drinker Cope and Othniel Charles Marsh, two men whose genius is only exceeded by their hatred for each other's guts. Now, with the aid of Theodore Roosevelt, Cole Younger, and Buffalo Bill Cody, Doc Holliday must save Cope and Marsh not only from the Comanches, not only from living, breathing dinosaurs, but from each other. And that won't be easy. Mike Resnick (Cincinnati, OH) has won an impressive five Hugos and has been nominated for thirty-one more. The author of the Starship series, the John Justin Mallory series, and the Weird West Tales, he has published over seventy novels and more than two hundred fifty short stories and has edited over forty anthologies. His Kirinyaga series, with sixty-seven major and minor awards and nominations to date, is the most honored series of stories in the history of science fiction. "The latest entry in Resnick's steampunk series featuring historical figures of America's Old West continues to showcase the author's grasp of the art of storytelling, particularly of the tall tale. Throw in some shamanic magic, zombies, and dinosaurs, and the result is a rollicking steampunk adventure for fans of American history and Westerns." "A mad mixture of steampunk and magic set in an alternate Wild West, this is hugely entertaining and should please fans of SF and westerns." "A fast, fun, and often-amusing tale where Wild West meets steampunk. . . . A modernday tall tale with the requisite larger-than-life characters." "Fast guns, fast plotting, and a comfortably entertaining writing style make this novel a rollicking western with a steampunk tweak."